If you are a member of Management Northwest but do not yet have a username and password to access members-only content and discounts, complete the form below. March 6-7, 2019 - 9 a.m. to 4 p.m.
Live Webinar: Administering FMLA – Are you really in Compliance? Wednesday, February 20, 2019 - 9-10:30 a.m. Administering FMLA – Are you really in Compliance? 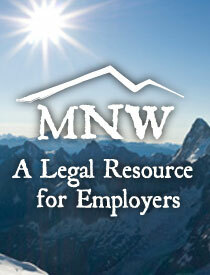 IF YOU HAVE MEMBER NEWS YOU WOULD LIKE TO SHARE, PLEASE EMAIL IT TO PBALL@MNWLEGAL.COM.